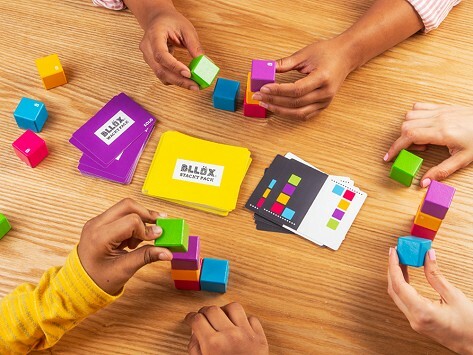 BLLÖX block puzzle game amps up the competition—and creativity—at your next family game night. Flip a card and race to build what you see before your opponents can. Want to get silly? A separate deck of cards packed with wacky challenges makes playing this fast-paced game more difficult and more fun. Dimensions: 5.4" x 6.2" x 2.3"
Always good for a grandma bag. All 3 granddaughters are having fun. Works with all 3 ages (2, 4, and 6) to challenge them and keep them busy. BLLÖX block stacking game is made by veteran game creator Vanessa Nobrega. She and husband Mark Ellingson are admittedly obsessed with games and are also the Makers of Mobi. After the success of that math-centric game, they switched their focus to creating a simpler, fast-paced game suited to a wider age range. After lots of testing and many iterations, that game became BLLÖX. BLLÖX is all about speed and stacking. Flip a card and try to recreate the pattern you see before your opponents can. If you want to make things sillier and also more difficult (a winning combination for any game night), the Wacky Pack cards dial up the challenges, like stacking with your eyes closed. We had a blast trying BLLÖX out. It’s easy to play and lots of fun for families and kids—or game-loving big kids, like us—to see how they stack up.